Dubai: When 32-year-old Alexander Gansel nervously proposed to 28-year-old Bianca Hohmann at At The Top on Tuesday, it had a ring of a 1,001 Nights tale – with a German twist. 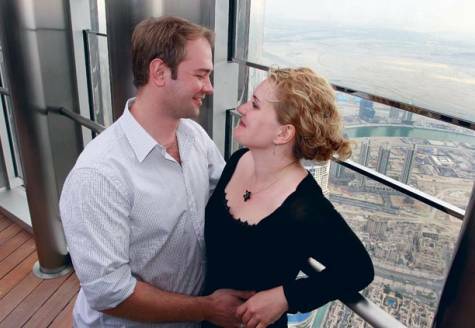 “Bianca, das ist ein ganz besonderer moment und ich möchte dich fragen, ob du mich heiraten möchtest (Bianca, this is a very special moment and I’d like to ask if you will marry me),” Gansel said minutes after stepping onto the 124th floor observatory of Burj Khalifa. Luckily for him, his sweetheart of five years said “Ja” [yes]. The couple, on a six-day tour of Dubai, were among the first visitors to the city’s newest tourist spot – about 3,000 people made it to the platform on Tuesday. “The overwhelming feeling to be on the tallest building and being the first group on the observation platform was amazing,” said the engineer from the south-west German city of Kaiserslautern. But not everything was right: Gansel had no ring for her. He later rushed to the Gold Souq in Deira and secretly bought her a diamond ring. The couple capped the evening with a dinner at the Burj Al Arab, where he had the ring delivered with a bundle of roses while the pianist played a Sinatra tune. “Just great. One could not have planned it better. Thank you, Dubai, for this great moment,” Gansel raved, adding they plan to tie the knot during summer or some time next year. People from all walks of life – and from all continents – queued for a chance to be among the first to visit the tower’s view deck. The youngest visitor was two-month-old Owais Awan who was with his brother Omar, four, and their parents Saqib, 31 and Mariam, 27. The oldest was Sutin, 75, from Thailand, who came with his family.